Recently voted the best Nordic Center in Grand County, Grand Lake Nordic Center sits on over 500 acres below the Rocky Mountain National Park and next to the Colorado River. It feels like the River flows through your soul as you stand looking down on the Colorado flowing under one of the two bridges at the Grand Lake Nordic center. The other bridge takes you over the Red Top Valley Ditch into some difficult terrain known as the river loop. The River Trail is delightful to ski, very user friendly. The trails are groomed 7 days a week for pristine freshly groomed conditions that are sure to please any skier. 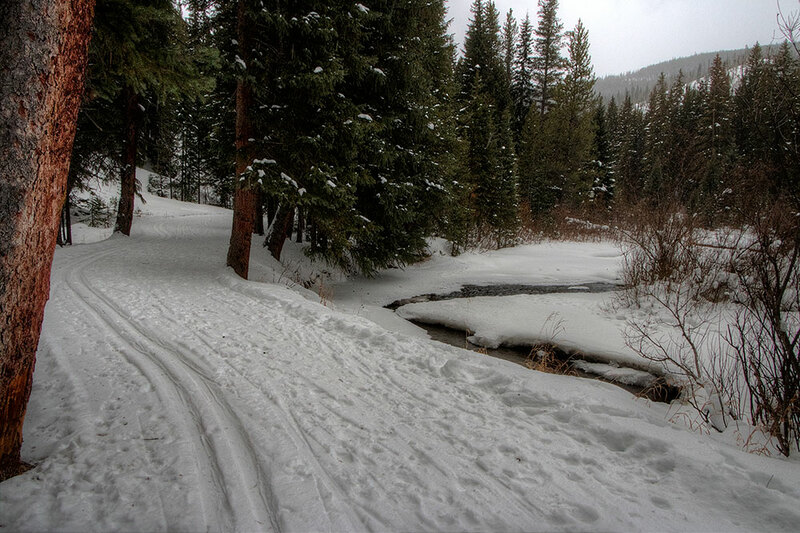 The Grand Lake Nordic Center has almost all trails open either packed or with tracks. There are over 4 miles of dog friendly trails that are designated for your faithful companion. 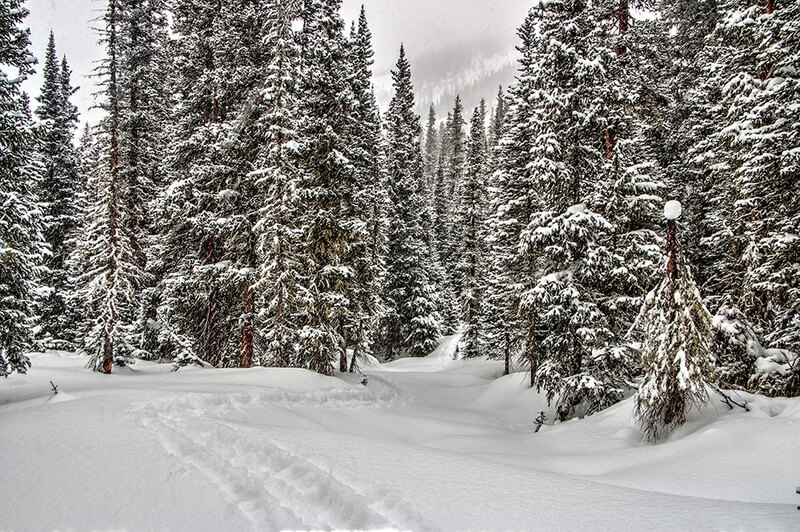 Skiing and Snowshoeing are both enjoyed equally with the addition of the Colorado River snowshoe trail that meanders down to the Colorado River, a sight to behold during the winter months. The lodge and ski shop has a great selection of new classic and skate equipment with new apparel from Salomon and Swix. The trails are very user friendly and skiing Randall’s Romp allows you to intersect nearly all the trails at the center. The dog loop has again been expanded in size and allows your furry friends abundant opportunity to wander the area. The Grand Lake Nordic Center is very welcoming to both the expert and novice skier with terrain for all abilities. The lodge is very accommodating and friendly whether sitting by the fire enjoying a cup of hot chocolate or relaxing after a long day of skiing with your favorite drink and friends. It just feels good as the trails wind in and out of the Rec District property through the forest to the neighboring private land where owners have allowed ski and snowshoe access for over 35 years greatly expanding the terrain. You feel as if you are skiing right in the national park! The newly improved Tubing Hill visible from the lodge is free. Tubes are available or bring your own! Kids of all ages love it! The tubing hill will be lit on all moonlight ski events and is still free for all to enjoy! Trail fees are $18.00 daily with only $8.00 for 16 and under. Five-day punch cards and half-day rates are also available. The rental shop has new boots and new skate skis added to their ski and snowshoe equipment to rent plus equipment, clothes and other gear and accessories for sale. Grand Nordic free ski lessons are offered Dec 16 to everyone with free trail passes and rental equipment for all Grand Nordic Club members. Pre-registration is required thru the Nordic Center to reserve your lesson space and if you need to reserve equipment. The first full moon ski of the season is Dec 22 from 5-9pm weather permitting with chili served in the main lodge. The Nordic Center each month has a campfire with complimentary hot chocolate and marshmallows but please call ahead for weather conditions. In February, Grand Lake celebrates Valentine’s Day with a 2-for-1 Trail Pass deal and the Romp and Stomp for Grand County Pet Pals and their mission toward promoting responsible pet ownership and spay/neuter campaign. The Grand Lake Classic Race at the end of February benefits the Grand Nordic kids programs. For information on these events and for dates on guided Nature Snowshoe hikes, call the Nordic Center at 970-627-8008 or visit the Rec District website www.grandlakerecreation.com.